Alexis here taking over the BG Blog! 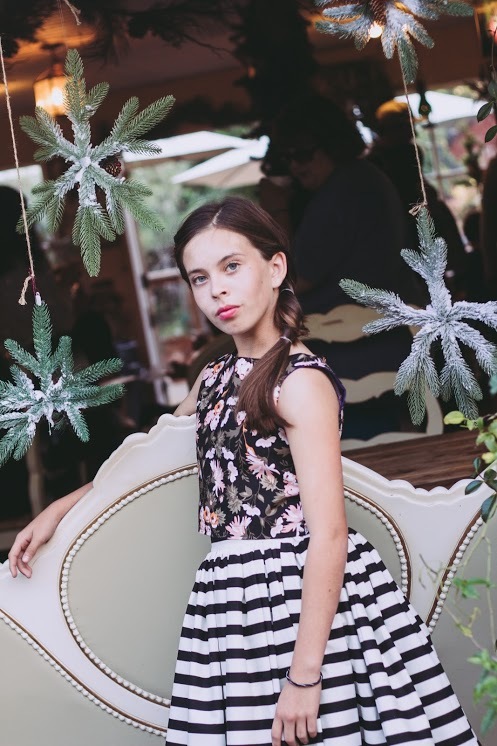 Hope everyone has been enjoying the Holiday season. It is crazy to think we only have 10 days left! 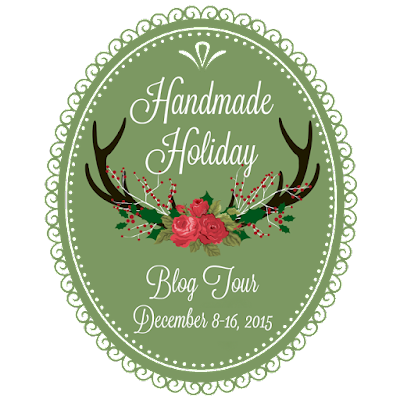 Also a shout out to Riley Blake Designs ﻿for sponsoring our Handmade Holiday Blog Tour. 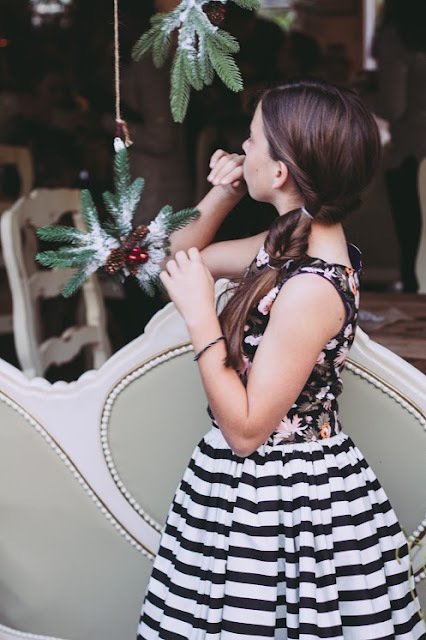 I am the type of person that does not use Green and Red for every Christmas dress I make. I like to play around and step outside the box. For this outfit I used Carina Gardner's new fabric collection, Apricot & Persimmon. One of my favorite things to do in the sewing world, other then starring at beautiful fabrics, is mashing patterns together. 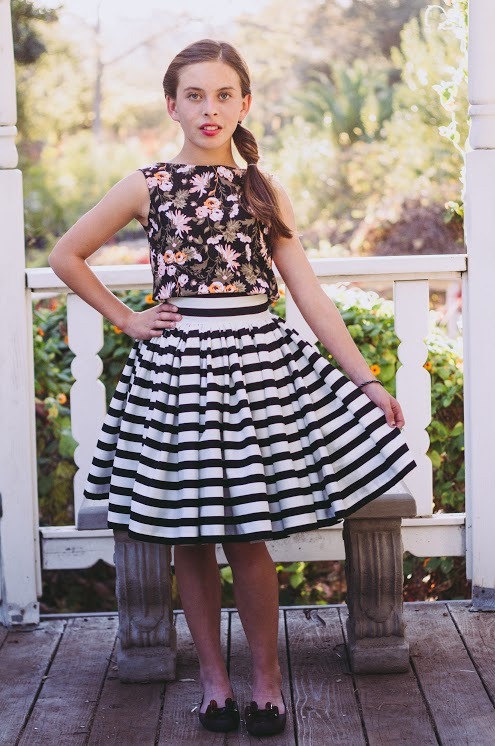 I used the Lazy Susan Bodice and the Lottie Skirt Pattern to make this two piece outfit. Blouse: I added about 2"-3" to the length of the bodice (actually I first added 8" to be safe and after doing a fit check I cut off 3/4 of it). After the bodice is constructed per instructions, tuck in the raw hem using 1/2"-1" seam allowance. Basically fold the raw edge of the liner and the main fabric inside the bodice and hem. For mine I used a double stitched hem. Skirt: Constructed per instructions but my skirt is about 4 yards of fabric! YES, 4 YARDS!!! Beautiful Fabric design with two amazing patterns, make for one happy seamstress!! 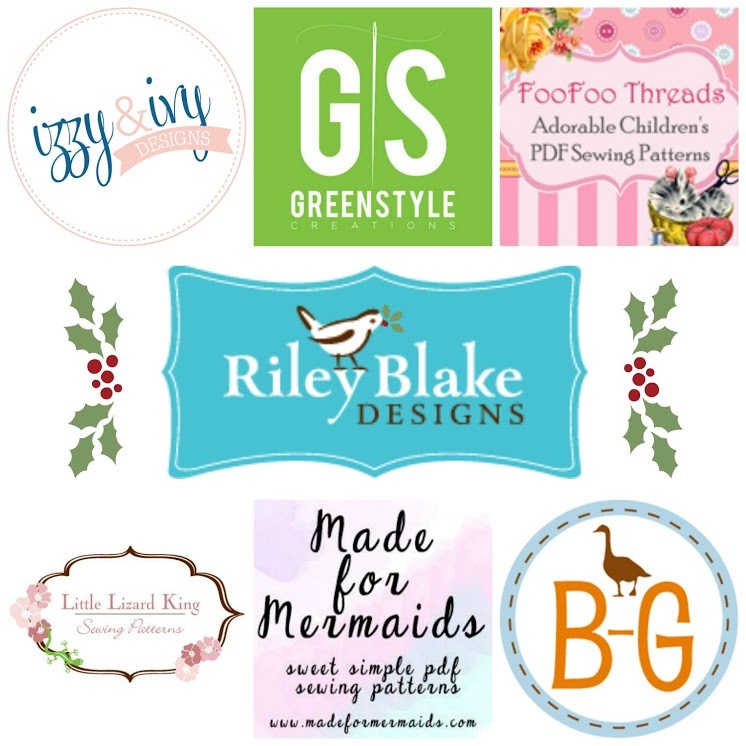 ALSO, don't forget to check out Whimsical Fabric﻿ for more Riley Blake Fabrics AND take 10% off now through December 20th when you use the code HOLIDAY! If you have not already entered the GIVEAWAY now is the time to do so!!! 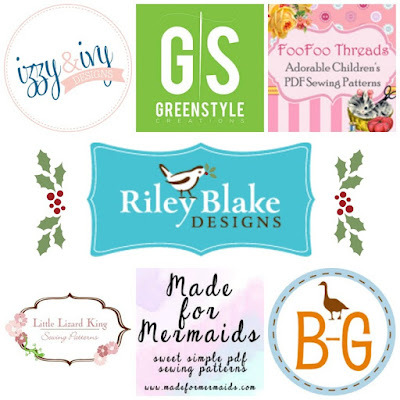 Click this link to enter to win a pattern of choice from each of the above designers. What an amazing holiday gift that would be!! Thank you again to Alexis, what a beautiful stop on this fabulous Holiday Tour. While I am supposed to be finishing up shopping today...I am feeling the need to sew instead! Cheater, Cheater PLACKET and BUTTONHOLE beater! A BG Luna Hack. Do you remember that song from childhood? and there he kept her very well? I can still see myself sitting at my grandmother's piano "playing" that song. It isn't a highly skillful song, one that you can do with one index finger. Being a piano teacher, I am sure that one index finger drove my grandmother almost as crazy as the repeat "cheater, cheater" all day long, but somehow she had the patience of a saint when it came to me and so she just ignored it all-together. ;) Speaking of my grandmother, I can almost hear her "tisk-tisking" as I sit down to write a blog about a hack that eliminates a skirt placket and buttonhole on a child's dress. I spy a little Reese Whitherspoon in that last one. And I mean that in a good way, I love her. So, here goes. 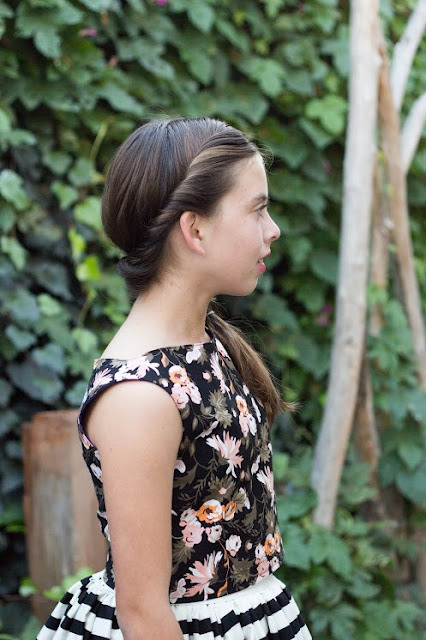 I will show you how to eliminate the skirt placket and functioning buttonhole from your Luna dress (which you have all bought like crazy, gosh I love you!!!). With this method, the yoke seam is no longer hidden...but again, your secret is safe with me. You may notice I am working on the same fabric as I am in the actual pattern. Louisa loved the chartreuse and navy dress I made her with the angel sleeves, so I made one with 3/4 length sleeves as well for a photoshoot. In the days of athletic shorts and t-shirts, I almost jumped at the chance! This tutorial will coincide with the actual pattern tutorial. So, I will reference methods from time to time in the pattern. First things first. You must make sure that you can fit the Luna over your kiddo's head without the need for the functioning button and placket FIRST. So I suggest to make a muslin of the yoke. Since you want to test the opening of the neck, cut 2 front pieces on the fold and use one of the front pieces as the back. This will give you an idea of how it does without the opening. If you get the green light, follow me! Cut your Luna yoke just as you would in the pattern and sew the shoulder seams on both the outer and lining as you do on page 9 of the pattern. Press your seams. Now place the outer yoke and lining right sides together matching up the shoulder seams and pin in place. Here, you will sew along the black lines as shown below. As you can see, the only difference form the pattern is how you will sew down the back sides as well this time. Once sewn, clip the corners and edges as shown below with the white lines. Then take your yoke over to the ironing board and press it out. Take your time here because the yoke really is a stand-out piece! Once pressed, you can top-stitch along the insides of your yoke as shown below with the black lines. Once overlapped, pin in place and run a basting stitch along the bottom as shown below in black. This will hold your bodice together. Side note: if you want a little more room in the Luna, decrease the amount you overlap. Now set the yoke aside for just a bit and grab your skirt pieces. You will not be cutting down the center of the back piece like you do in the pattern since you don't have a placket. Run a gathering stitch along the top of both the front and back pieces. Good grief, Amy learn to iron first!! Now, pull the gathers in on one of the skirt panels to match the bottom of the yoke front. UNLIKE the pattern, you will be attaching the skirt piece to both the yoke outer AND lining. 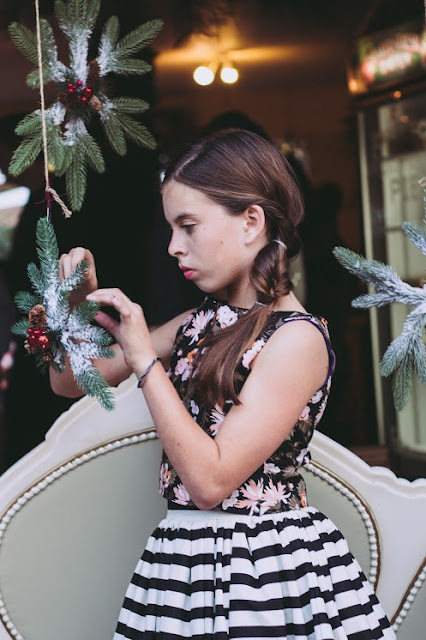 Once you have the gathers distributed, place the skirt panel right sides together with the yoke making sure the raw edge of the skirt aligns with the raw edges of the yoke outer and lining. Pin in place and sew along the bottom as shown below with the white dotted line. Finish this seam however you please and then repeat with the back skirt panel and back yoke. Once you have the skirt panels attached, head over to the ironing board and press the seam up towards the yoke. If you are going to top-stitch, now is the time. Just as I said in the pattern, I don't like to top-stitch over my trim so I decided against it here. However, if you are going to top-stitch, run your stitch along the seam as shown below in black. Now, flip your yoke over so that the back is facing up and place your button on the overlap as shown below. Sew the button in place, and guess what ladies...you are now ready to tackle the rest of the pattern! For View A, start at the bottom of page 18 and for View B, page 26. Make sure to ignore any talk in the rest of the pattern about keeping the lining out of the way and then enclosing the skirt seam. How's that for a quick hack? 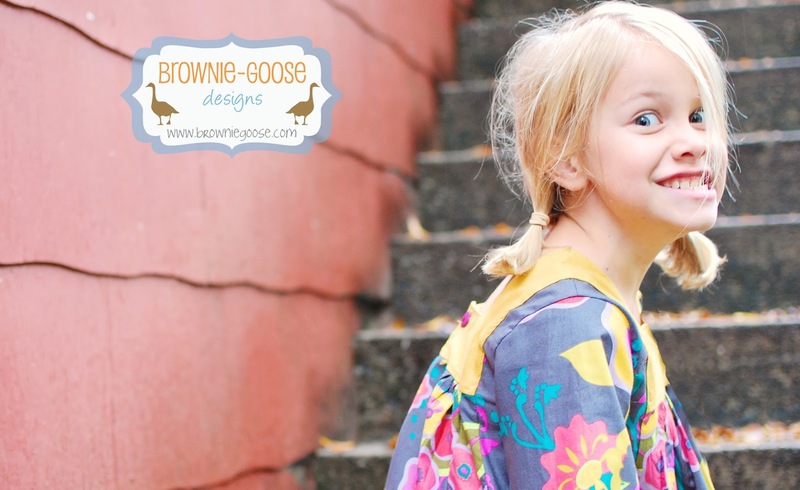 The best part about this method is that you can use it with so many patterns, AS LONG as your child can get it on and off without the need of buttons or a placket. Again, ladies you have rocked the Luna debut and since I am uber-disorganized right now, I forgot to change the price of the Luna last night in the etsy shop - so take advantage of my disorganization and shop with a discounted promo price for one more day! Thank you again for your continued support and overall awesomeness. I will be disappearing for the next few days since I have yet to swap over mine or my kid's closets for the season change. Thankfully we live in the bi-polar South so we've been managing for the last few weeks...but I am pretty sure it isn't acceptable for me to wear the same shirt 4 days in a row. Whoops. Happy, happy Friday everyone. I hope you have all had a great week and hopefully you have been able to take advantage of my LUCKY 7 week and get some patterns on sale. If not, my patterns will stay reduced to $7 through the weekend and be back to regular price next week. 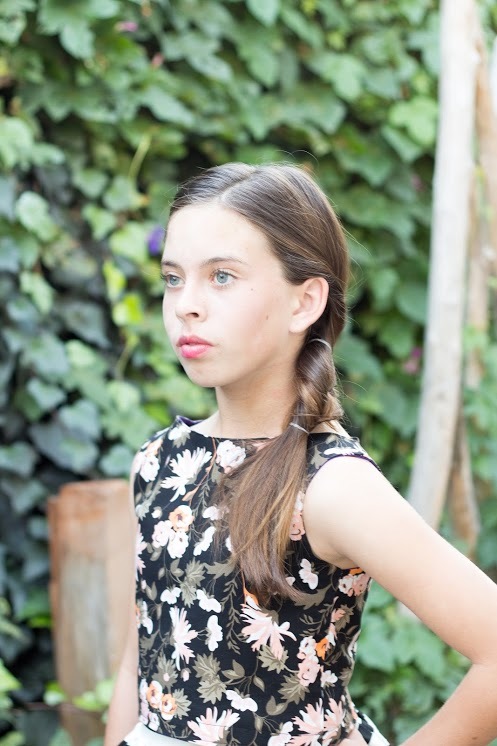 I hope you have also had a great time seeing all the sneak pictures of the Luna dress. Good gravy, I love this pattern. I am going to spend the weekend finishing up some last minute things with the pattern and have it live and in the shop come Monday! Just as Jimmy Buffett says...Come Monday, it will be alright! Speaking of things being alright, how about if I told you there were two amazing giveaways going on for the Luna AND some Art Gallery fabric??!! 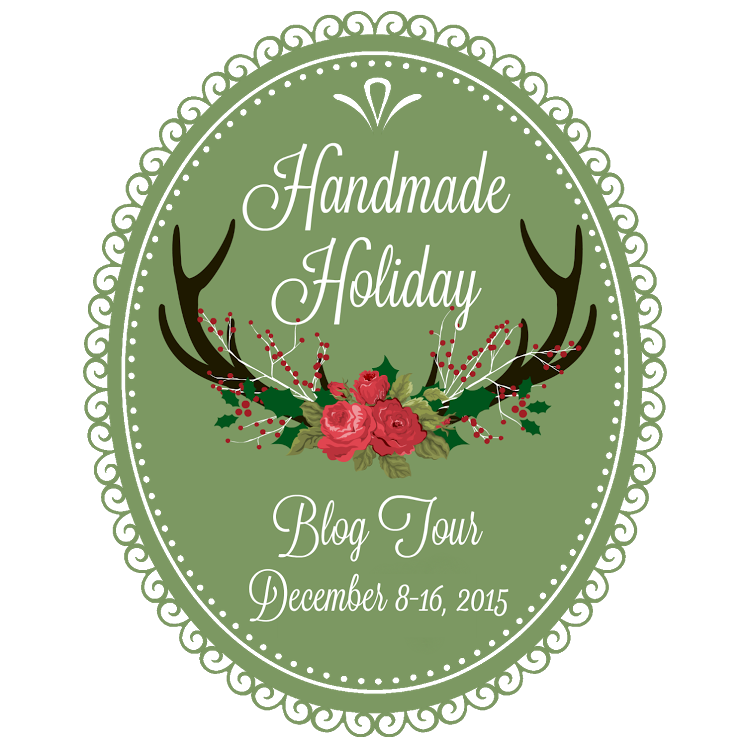 Check out both of these blogs and enter the giveaways for your chance to win!! Baby Hobbes Design: Luna Luna! You had me at Hello!! Oh Luna I love You So! Earlier this week I promised you a tutorial on how to add big pockets to your Lottie skirts and also make it with an elastic waistband (just in the back so the front still has that polished flat look). I had hoped to blog before Friday, but we all know how life is. This seems to be wild time of year for me as I am trying to tie up all of the loose ends with BG before the holidays begin. 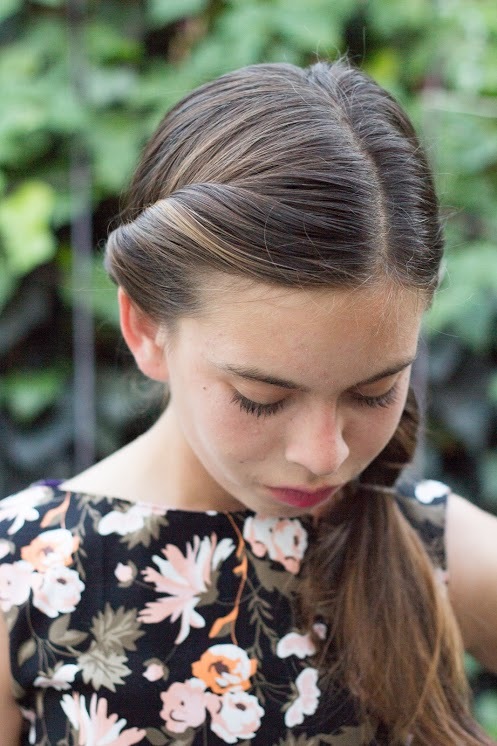 So, needless to say...here it is Friday morning and I am just now getting back to you with the Lottie tutorial! 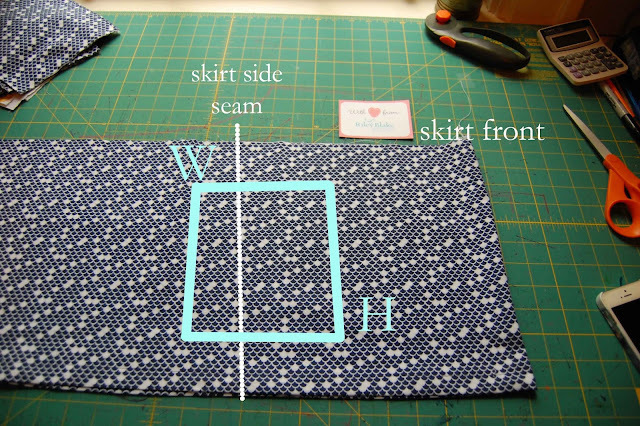 This tutorial will show you how to make some changes to the Lottie skirt pattern. Since the pattern is very detailed, I won't go into many details here but instead will reference the pattern. First things first, let's start with the waistband. Since there will be no closure in the back, cut 2 of the front waistbands. There are patterns pieces, or dimensions for those that would rather in the back of the pattern (starting on page 45). 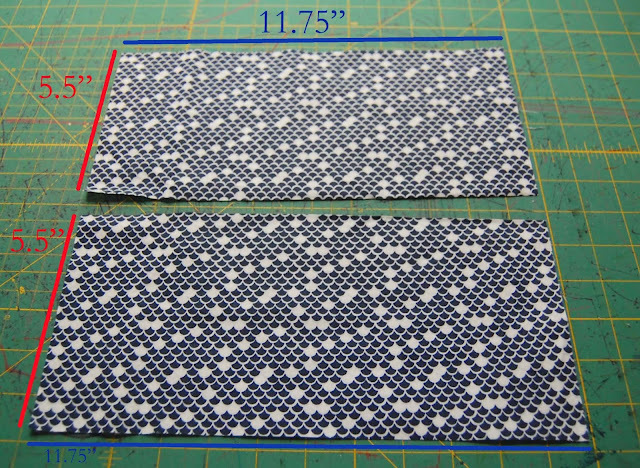 I am making a size 5, so I am cutting 2 pieces of fabric that are 5.5 x 11.75. 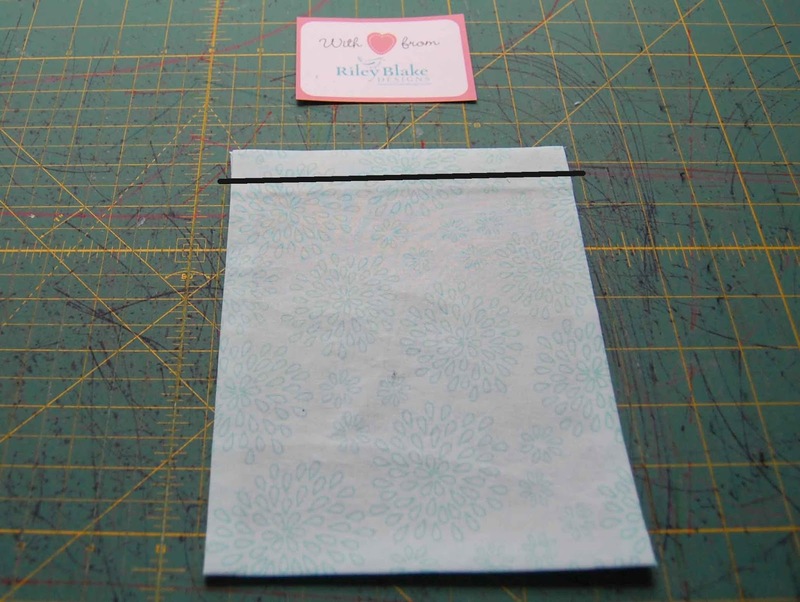 Once cut, place the 2 pieces right sides together and sew along the sides as shown below with the dotted lines. Take the waistband over to the ironing board and press those 2 seams out. Now, fold the waistband over on itself with right sides facing. Run a stitch along the top of the waistband (the folded edge) as shown below. This is exactly like you do on page 10 of the pattern, with the only exception being that this waistband is tubular since it is joined on both side. And because the Ninja Turtles think it is cool. Totally tubular. Once stitched, flip the waistband right sides out and then head over to the ironing board and press the top seam that you just stitched flat. 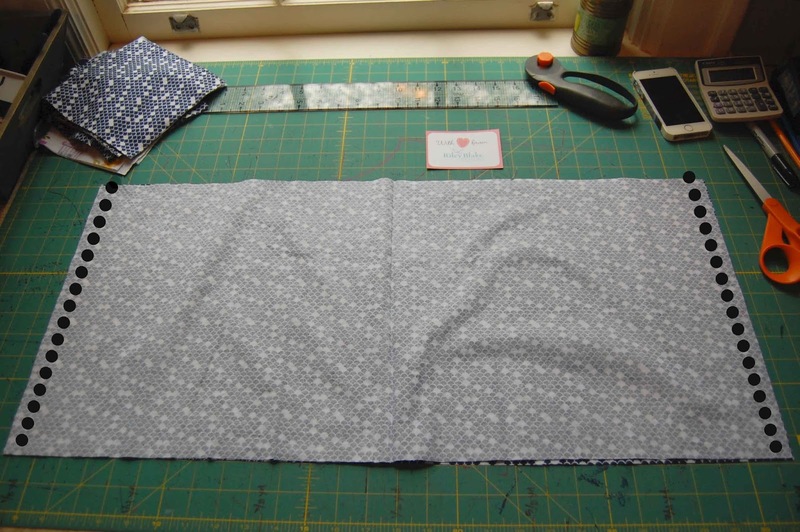 While at the ironing board, go ahead and flip up a 3/8" hem along the bottom of one side of the waistband as shown below. This will be the lining side and will help us to enclose the skirt seam later on. Once that hem is pressed, set your waistband to the side. Now on to the skirt panel. I have only done this particular skirt with the elastic back with the gathered skirt. Personally I cannot ever seem to get my pleats to look right when I use an elastic waist, so I don't even go there. But, you can certainly try it out if you like! For this tutorial purpose, we will be focusing on the gathered skirt. 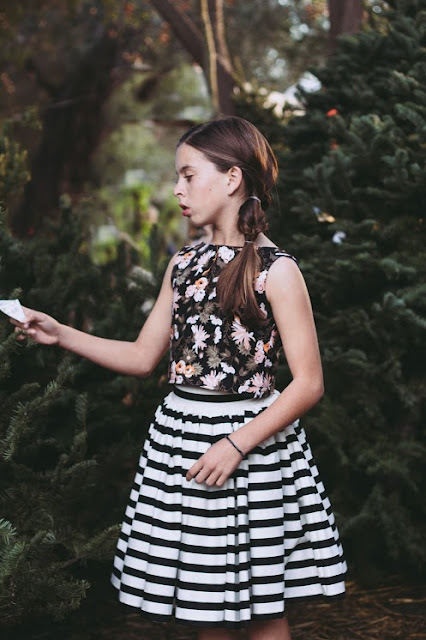 On the pattern page 6 you will find the cutting chart for the gathered skirt of the Lottie. For this look, you want to cut 2 front skirt panels. Again, I am doing a size 5, so I will cut 2 panels that are 14 3/8" x 23 1/2". 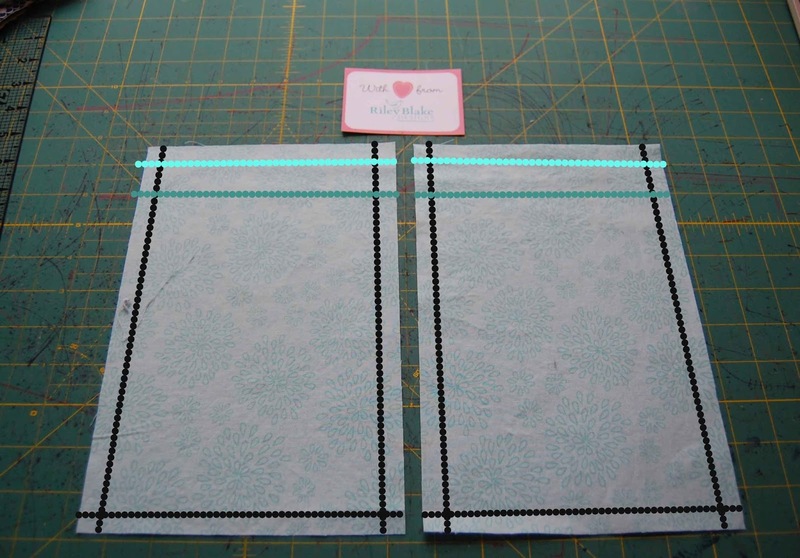 Once cut, place right sides together and sew up along the side seams as shown below in the black dotted lines. Finish those seams and then press. Alternatively you can also do these with french seams and then the entire skirt will have beautiful finished, hidden seams. :) Sometimes the insides of a garment make me just as happy as the outside! Once your side seams are sewn, go ahead and hem the bottom of the skirt. I find it easier to go ahead and hem it now. Follow the directions to hem just as you would in the pattern starting on page 41. For the pocket, there is no right or wrong here. Louisa wanted a skirt with a big pocket. She saw on in a catalog this summer (possibly Mini Boden???) and has been talking about it ever since. So, Momma wanted to deliver! 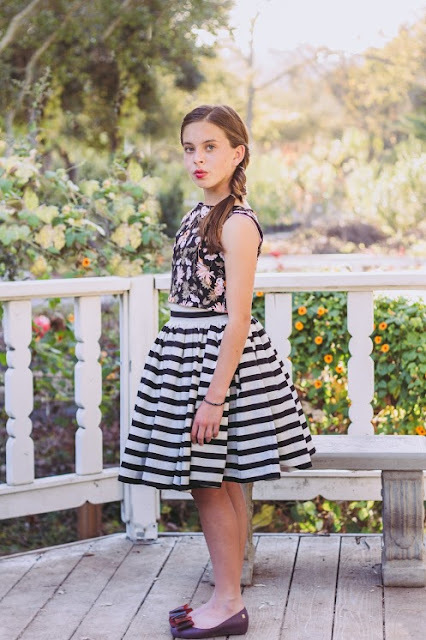 Place your skirt panel on a flat surface where one of the side seams is facing up. This is where you will need your best eye-balling skills. Again, no right or wrong here, but let me tell you what I do. I like to make a large, rectangular pocket that sits off-center of the side seam. This basically just means I want more pocket to the front of the skirt than I do to the back. Below in turquoise I sketched how I eye-balled the pocket. Remember that you will have a 3/8" seam at the top of the skirt. For this skirt, I ended up making a sketch that had a width (W) of 8 by a height (H) of 8. Now, for some math. I mean, it wouldn't be a BG tutorial without math now would it? :) So the pocket sketch you made will be for the finished measurements of the pockets. But, you need to know how to cut them. So, I have some formulas for you. For the height (H), you want: H + 2.5. So, in my example for a finished pocket with W of 6 and H of 8, I will cut TWO pockets that are 7" by 10.5". Once your math is done and your pockets are cut, finish the 2 sides and the bottom of the pockets however you please. Then, head to the iron and press to the wrong sides a .5" hem along the bottom and sides as shown below in black. For the top, press down a 1" hem (turquoise line below) and then another 1" (darker turquoise) for a finished hem. Once pressed, top-stitch along the top hem as shown below in black. 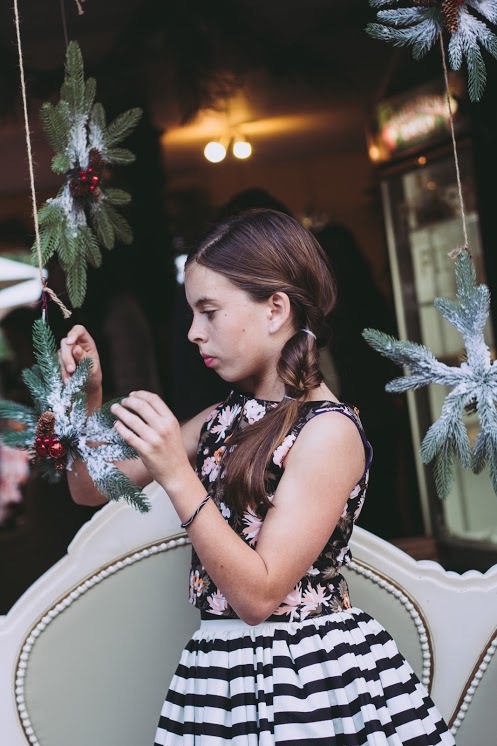 With your skirt panel on a flat surface with one of the side seams facing up, place the pocket on the panel how you would like it. Again, this is not rocket science at all but I like to place mine off-center so more of the pocket is towards the front. There is no sense in having a great, big awesome pocket if her hands cannot reach it, right?? Once you are happy with placement, pin in place and then repeat with the other pocket. Make sure both pockets are symmetric! Once they are pinned, head over to your machine and stitch the pockets in place as shown below in black. I like to do a triangle stitch at the top of each pocket to reinforce that seam since it will see a lot of wear and tear with hands going in and out of the pocket. 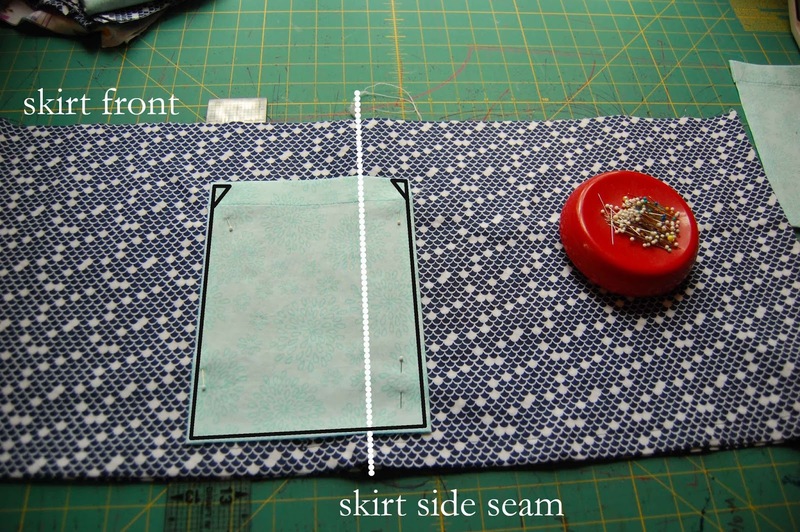 Once your pockets are sewn in place, run a gathering stitch across the top of the skirt. On page 28 of the pattern, I show how to do this and this tutorial is similar, but you will only have 2 stitches, one across the top front and one across the top back. Continuing on via the pattern, match up your skirt side seams with the waistband side seams and pull your gathers in to match the waistband. Pin in place and take to the machine and stitch the skirt to the raw edge of the waistband. Remember how we pressed up the hem of one side of the waistband earlier? Make sure that is not included in this stitch! Once you have your skirt stitched to the waistband, finish that seam. It will be enclosed but finishing helps to reduce the bulk. Now, take to the iron and press the seam up towards the waistband as shown below by the yellow arrow. This is always a fun step to me. There is just something about seeing a gathered fabric pressed against a non-gathered spot. Oh it makes me happy! Staying at the ironing board, flip your skirt over and then press the other side of the waistband (the side you pressed a hem earlier) over to cover the skirt seam. Press all the way around the skirt as shown below. See how awesome it looks when it covers the seam? Now, take your skirt to the machine and top-stitch around the top of the entire waistband as shown below. This will help create the casing for our elastic. You see this machine? This is Louisa's sewing machine. My faithful Brother that lasted me 5 years longer than it should went caput on me and so thankfully I had Lou's to get me through some garments. Phew! Now, you can either use Wonder-Tape or pins, but you want to secure the waistband over the skirt seam in the front. ONLY THE FRONT for right now. Since it is only the front, I usually will just use pins. Then, take to your machine and top-stitch along the skirt seam on the front ONLY as shown below. This helps to enclose that skirt seam. This is what it will look like on the inside of the front of the skirt after you have sewn it down. For the size of elastic to use, I recommend using the widest you can for the casing. In my case, I used a 1.5" wide elastic. I probably would have been fine with just 1" since it was a bit difficult to pull through, but it was all I had on hand so I made it work! Now, with your piece of elastic, you want to feed it into the waistband back as shown below. Pull it around to one of the side seams. Pin in place with aabout 1/4' of the elastic to the front of the side seam. This is shown below with the elastic in green. In the photo below, the skirt front is to the right. Now, to secure the elastic, stitch in the ditch (meaning run a stitch on the side seam of the waistband). This is shown below from the RIGHT side of the skirt in black. 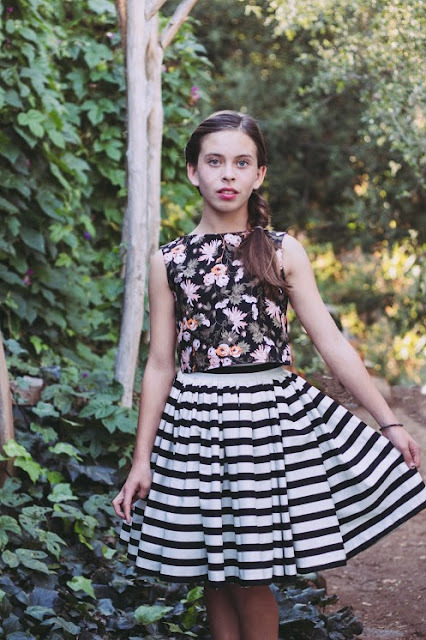 I am sorry I realized just now that it may be confusing with the front of the skirt on the right in the photo above and below it is to the left, but hopefully you catch my drift with the green area posing as the elastic. Once that side is secured, do the same with the other side of the elastic and the opposite waistband side seam. Once your elastic is secured in both places, you want to sew the back of the skirt along the skirt seam. I find this is easiest to do on the machine while pulling the elastic taught and sewing along the seam. Guess what ladies? 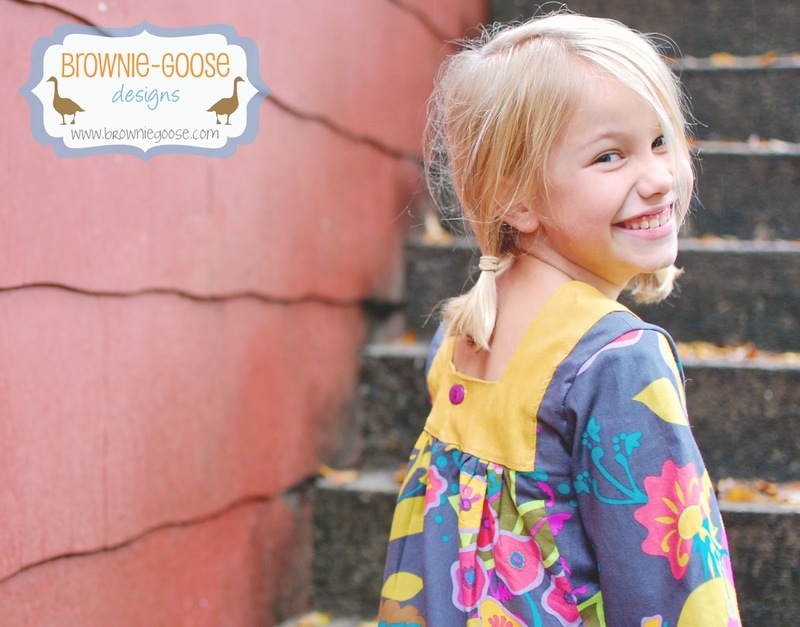 You now have an adorable Lottie with big-ole pockets and an elastic-back waistband! I cannot wait to see your pictures! 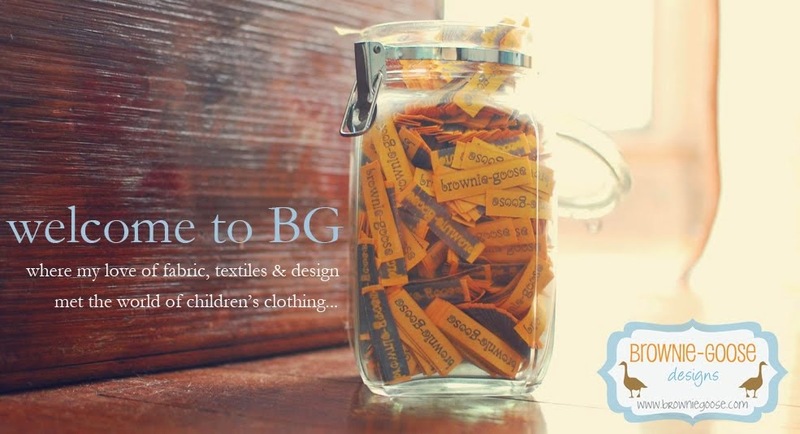 Make sure to upload them in the brownie-goose lovers group on Facebook! And don't forget, go enter those two giveaways and have a fantastic weekend. Get some rest for the LUNA release on Monday! !